PTCL has introduced Pakistan's first 3G USB Modem with in-built Wi-Fi Hotspot. Now you can connect upto 5 gadgets at hyper speed of 9.3 Mbps via this 3G USB Dongle. It supports both 3G and Wi-Fi. It has universal Wi-Fi compatibility. PTCL has 3G Nitro coverage in about 200 cities while Evo coverage in more than 250 cities. This new USB device will automatically switch between Nitro and Evo systems whichever is available at your location. It does not require any installations. Just plug Evo Wingle and start surfing. You can power it through any USB Power Adopter and it will become Wi-Fi Hotspot and will give Wi-Fi coverage in 100 meter circumference. You can use any Wi-Fi enabled gadget (Laptop, Tablet, Smartphone etc) after creating link with it. Unlike Nitro Wi-Fi Cloud, Evo Wingle is a smart USB Device. Evo USB Dongle has a very compact and sleek design. Function of 3G Nitro and 3G Wingle is same however type of these two devices is different. Wingle requires a USB Power source but 3G Nitro just requires turned ON. 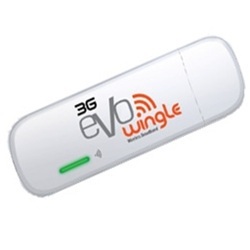 You can get your free 3G Wingle USB Dongle Device by paying 3 months advance line rent of Rs.7,500. Upon payment, you will get a USB Dongle with 3 months unlimited internet (100GB Fair Usage Policy applies). Price of only USB Dongle Device without bundle offer of 3 months internet is Rs. 4,000. After reaching prescribed volume limit, speed throttle to 256Kbps. Additional usage will be charged at the rate of Rs. 0.2 per Mb. You can recharge your Evo Wingle via PTCL Landline Billing, PTCL OSS, PTCL One Stop Shop, EasyPaisa, Ufone Franchise and Service Centers, MCB Bank, EvLoad. Can i use the evo 3g sim in an iphone will it work ? ?